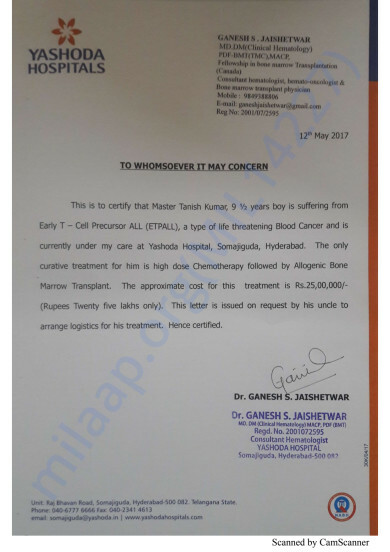 A child in a family of 9 years Tanish Kumar has been struck by Leukemia of type ETP T-ALL(Biphenotypic Leukemia) and is under the surveillance of Dr. Ganesh Jaishetwar. He is being currently treated in Hyderabad and undergoing Chemotherapy in Yashoda Hospital. It all started with Typhoid where his fever did not drop down for days and later the reports showed that the platelets, WBC, RBC count dropped drastically. Till date, he has undergone 7 chemotherapy sessions and the progress is very slow. The cells are multiplying again and a need for advanced heavy dose chemotherapy is required. The case seems to be complicated and could prove to be dangerous as well. The family has been spending a lot everyday, as the medicines, chemotherapy, bone marrow test, Dr's fees are all costly. The blood transfusion is done regularly and we are grateful to have many donors by now. I request you all to please help me in raising funds for his treatment so we can try our best and make things possible. Tanish is in a close family of mine and I would love to see him grow normally like other kids and enjoy his life. It is very heartbreaking to see a small child take chemotherapy but we have to count on Science. Alongwith, everyone is praying and asking God for support. I thank you all for taking time time to read. Please share to the max. Tanish was discharged from the hospital in the month of September, 2017. He is currently at home, living a life of a normal Kid. He visits doctors for regular check-ups and so far, there has been no complications. The family is extremely happy to see him active like any other kid of his age. This couldn't have been possible without the support of you all. We are thankful to each one of you for the love and support which you have shown towards Tanish, May God bless you all. Tanish is doing good now, he has got discharged from hospital and is very happy. 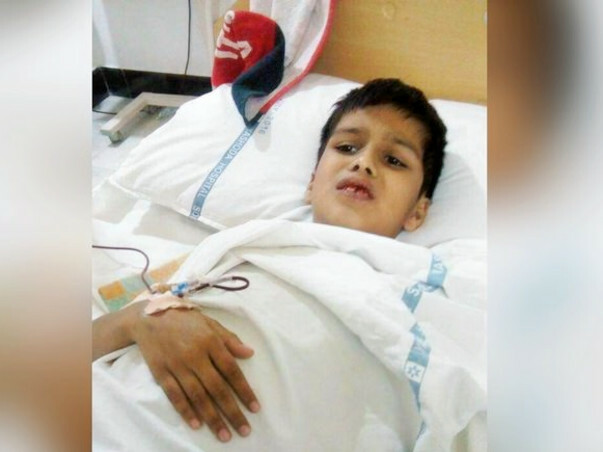 He has exhibited tremendous endurance and I wish he stays healthy and blessed like other kids. A big thank you to all from myself, Tanish and his family. I would like to share the good news with everybody is that Dr has now confirmed Tanish is out of danger. Bone Marrow Transplant has been completed for him and now he is in the recovery state. I hope Tanish continues to recover gradually, get better and stay stronger for all his life. I thank you all for supporting, engaging and standing through this difficult period. Lots of love to Tanish and everybody. God bless all and please continue supporting such causes, every little bit of help and affirms the existence of humanity.